Dear Little, sometimes you give me anaconda hugs when I come home after a long shift from the ER. There is nothing more rejuvenating than a special embrace from my love. Dear 9 Year Old Moti, you are the newest member of our family. You are in the 2nd grade, like science, and help your family carry water. I think your smile is contagious! Dear Thoracic Dissection Patient, yesterday you reminded me that life is short. Today I will be more intentional to value time with those I love. Dear Emma, your faithfulness has always led you to adventure. You are blessed to travel to Ethiopia this summer as a blogger for Food for the Hungry. I'm already looking forward to reading your posts and to seeing pictures of you and Moti together! Are you a hugger or a hand shaker? Em's a hugger. I prefer a firm handshake, unless I'm getting hugs from a little someone I know. Many of you have asked about sponsoring a child through a trustworthy organization. Look no further! 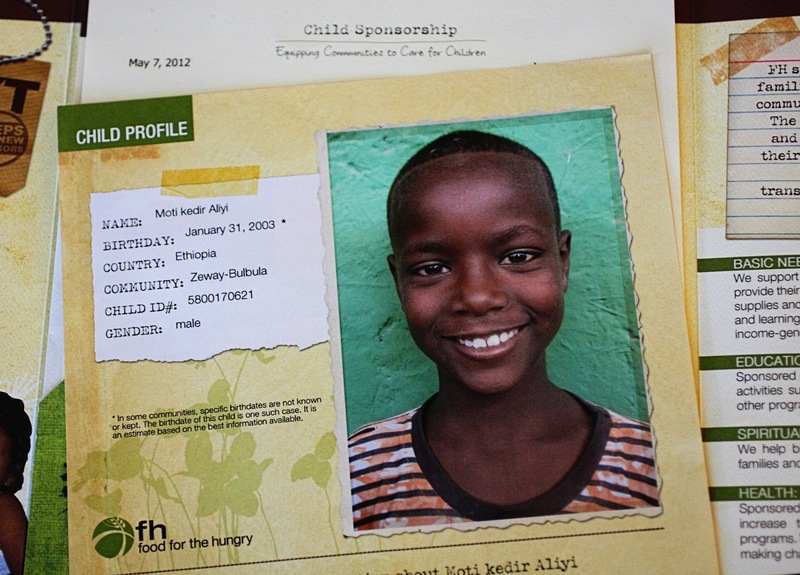 Click on the Food for the Hungry banners on our blog sidebar and sign up to sponsor a kiddo in Ethiopia. Be sure and snd Em an email and let her know who they are so she can meet them this summer. Here's the stellar team she'll be traveling with. emma, i hope you have so much fun this summer! and i'm a definite hugger. my whole family is very affectionate and thankfully, i've found a fiance who's affectionate as well. what a happy announcement! cool news! and ethiopia Emma..fantastic-such a dramatic, beautiful place! I am sooooo excited for our trip. I don't know about you, but I Ethiopia is already planting itself into my heart. Hugger for sure, although I can't remember the last time I was hugged. Women I hug. Men, I hand shake, unless they are a great guy friend. OMG! Look at that smile!! A very bright Light is shining through him! I've turned several non-huggers into huggers that way. Where will you be in Ethiopia? I spent a summer there, and then returned for two weeks the next summer. I definitely have a couple of kids there that I would love to take with me! Ethiopia will steal part of your heart for sure!